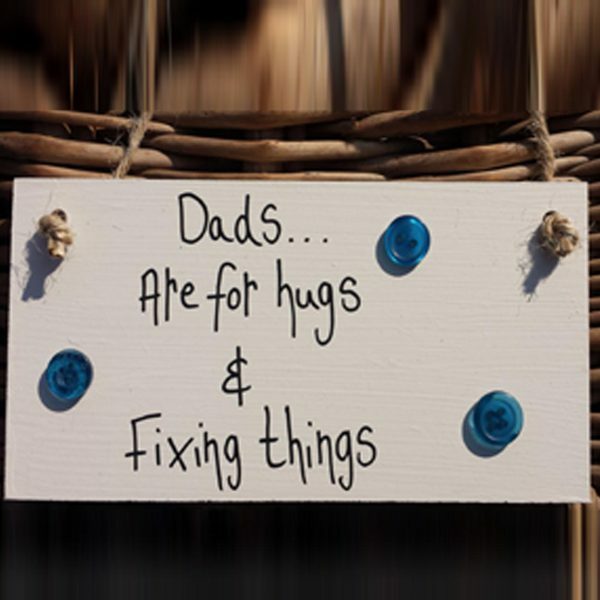 This beautiful handmade “Dads are for hugs & fixing things” personalised plaque make great gifts ideas for men, and are cool mens gifts for Dad on his Birthday, Father’s Day or any special occasion. Chosen with love for your DAD or your children’s Dad.. Personalised plaques make special birthday gifts for him on his very special occasion. This personalised plaque measures 6″ by 3″ approx. Note: All our products are handmade therefore may differ slightly than those shown in the picture. Embellishments may vary. Please note: Image colours may show up differently on Mobile Devices. Dad’s are really good at fixing things! The team here at MadeAt94 have a great selection of gift ideas for men that your Dad will love! Let your Dad know how much you appreciate him! Have a look at our product range and choose a plaque or heart for any special Dad occasion. Get your “Dads are for hugs & fixing things” plaque for Dad this Fathers Day or any other special occasion. Your Dad will love it forever. Gift ideas for men are a specialty here at MadeAt94. Our plaques are handmade with warmth and love for any special occasion. This plaque says it all with just a simple message coming from your Dad’s very special son, or very special daughter. Say I love you with this special “Dads are for hugs & fixing things” plaque today! Cut by hand, this wooden plaque is then prepared and painted in house. This is the same for all our Father’s Day or special occasion presents. The plaque reads “Dads are for hugs & fixing things”. Lovely gift for Fathers Day or any special occasion.